Natural refinement and horse proportion in miniature horses that is retained into maturity are elusive and difficult traits to achieve in this breed. 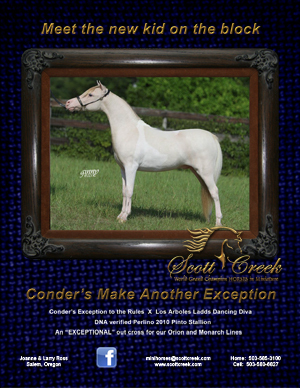 Condors Make Another Exception (MAX) brings the refinement of the First Knight lines to the Scott Creek Breeding program. MAX is a direct son of the the young upcoming sire, Conders Exception to the Rules by First Knights Breaking All the Rules. Exception to the Rules is 2012 AMHA Top Ten Futurity sires and has sired several World Champions in his first few foal crops. We feel MAX can have the same success in our breeding program. MAX measures 32 inches tall and possesses genetics to produce pinto and buckskin. Being a double dilute (perlino) he should always produce the dilute…bucksin, smoky black, etc. 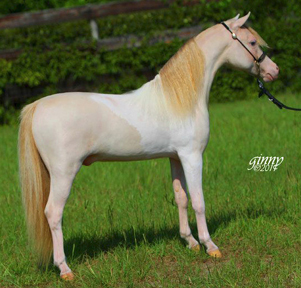 His first 2013 filly was a buckskin pinto. We look forward to having a lot fun with this color gene along with producing our outstanding elegant confirmation and attention getting movement for which Scott Creek horses have a world wide reputation. 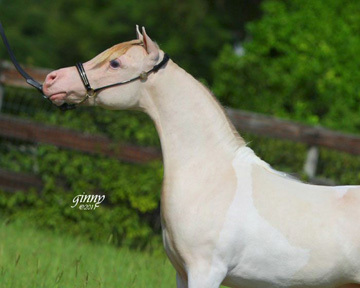 For one stallion to produce offspring with presence, movement, natural refinement, and attitude in the miniature horse breed with the dilute color is truly rare. MAX is one of these rare individuals.